A forgettable end of the world epic that focused on a killer virus. 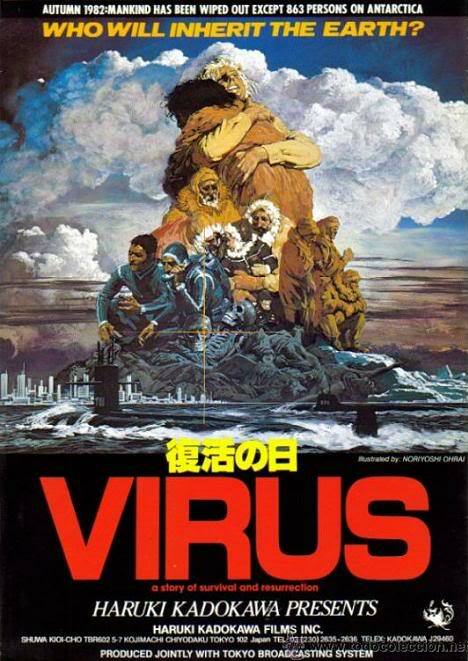 Virus is a end-of-days, survival horror movie from 1980. It’s a Japanese produced major international film from rookie director Kinji Fukasaku. It’s an ambitious movie that boasts a very diverse cast of characters. It has a good deal of roles from actors like Masao Kusakari, Isao Natsuyagi, Sonny Chiba, George Kennedy, Bo Svenson, Edward James Olmos, Glenn Ford and Robert Vaughn. It was also filmed in Alaska. The original cut runs 156 minutes with a US cut running at 103. I am watching the original cut of the film. 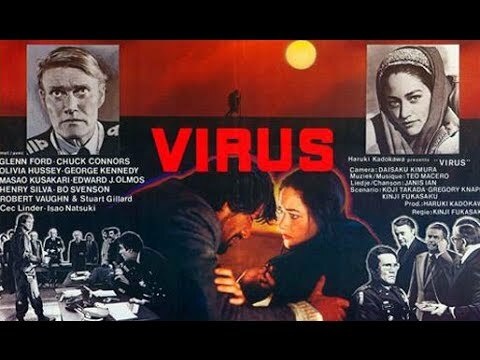 The movie is about the outbreak of a virus called MM88 that destroys most of the human population. A group of scientists in Antarctica are tasked to find a cure that may help. It follows the virus and it’s slow effect on the remainder of society. We get into a political drama with the President of the United States being filled in on the scope of the destruction. We then get a strange Black Mirror type situation when the remaining eight hundred some-odd men are determining how they are all going to sleep with the remaining eight women. It’s bizarre. This movie puts elements from movies like The Thing, Halloween, and Dawn of the Dead into a political drama. Unfortunately it doesn’t work very well. It's boring. It had a $16Million dollar budget but still couldn’t seem to tell a deep and compelling story. The acting is alright, but they are just standing around talking for 90% of the time. There are some really great shots of major cities reacting to a virus outbreak, but these are really just clips and sporadic shots. The best part of the movie is when footage of Japan is shown after the virus wipes out a city. The worst is watching everyone sit around listening to a five year old shoot himself. For a film that was intended for a major international release, this didn’t bring much. The story was far too shallow and it ran too long. The original feature, the one that I am reviewing, runs for 159 minutes. This story would eventually be told time and time again in future productions like Outbreak or Contagion, in a much better fashion. While I appreciated the effort of director Kinji Fukasaku, I think he had bitten off a bit more than he could chew. While it boasts an all-star cast, Day of Resurrection was too ambitious a task.